Forbes revealed its list of the highest paid celebrities in 2016. Taylor Swift took the number one spot with a sizable $170 million. Controversial radio host Howard Stern took the 7th overall spot with $85 million. Howard signed a new five-year deal with SiriusXM Radio at the end of 2015 but dropped two spots in the Forbes rankings from the previous year suggesting he took a pay decrease. Forbes had listed Stern 5th last year with $95 million, indicating a $10 million drop in salary per year. 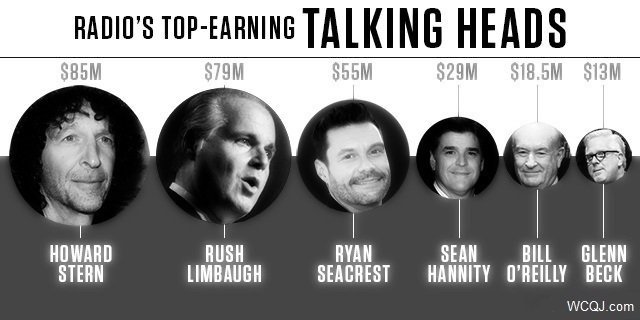 Another controversial radio host, Rush Limbaugh came in tenth with $79 million. Limbaugh reportedly earned a lot more in 2016 due to the presidential election. Alex Jones did not make the “Radio Talking Heads” list this year. Financial terms of the deal were not disclosed, though experts in the industry have stated that the new contract is slightly more lucrative than the last. The new contract with SiriusXM, which took effect at the start of 2016, includes a push in development of new technologies. SiriusXM now has an estimated 29 million listeners. Joe Rogan: Remember when Howard Stern ran for Governor?